As I catch up on my Ys after a busy biz day, I ooh and I aah. Well, you see, there are capes and capris for me! Yippee!! Two very different designers had shows in Paris today – Yohji Yamamoto showed his signature line and Stefano Pilati showed his much-anticipated final collection for YSL. While the former had a punk vibe and the latter an air of precise elegance, both seemed to resonate with individual parts of my fashion soul. Both collections showcased things that I have loved and will love from A to Y. 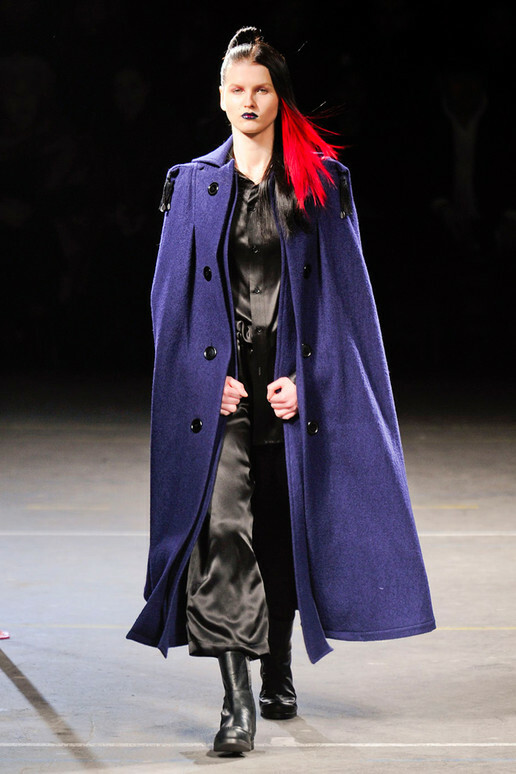 The loden was luscious at YSL, a collection that grew from the streamlined calla lily. The tunics were roomy, yet cinched ever so. But really, despite the mathematical perfection of the tunic + belt + gloves + fur drape + burgundy lip (sigh), the tailored capris and scrunched boots were greater than the sum of those parts, for this girl. This combination is one of the staples in my closet. I always feel polished in it. Mr. Pilati's final collection for the house was nothing short of pristine. I did grow up with punk roots, however, so I also adore the variation that Mr. Yamamoto showed. A corseted capri? Ai-yai-yai. Also, note the lacing on those boots. My dears, this is Japanese ingenuity. Punk kids (the originals – not the 2nd or 3rd coming, thanks) were the first ones I saw in capes, too. I remember staring at them in awe. My first cape sighting: a boy in a studded moto jacket (custom, nach), Docs, mohawk (no faux, then), cape draped OVER the leather jacket! It was brilliant and I wanted it immediately. However, my Indian mother would have fainted if I wore a cape back then. My pointy shoes and black clothes worried her enough. Rebel with a fashion cause. And when you thought it couldn’t get any better, it does. Asymmetry, can I return to you at last? Is everyone else done with it, now? The cape has become so much more accessible. 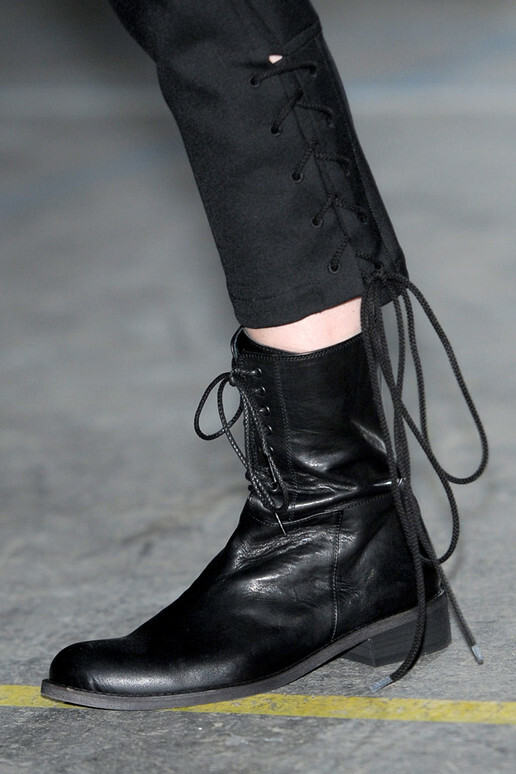 You know I will always love the extreme versions of it, but it can also be subdued, like it was at YSL. Love the pairing of the cape and the capri in the same ensemble. Pilati also recognized the grown-up in us, past punk lovers. I always feel grown up and put-together in a killer suit and I’d die for this leather-lapelled capri version. Oh look, it’s worn with a pointy boot, too. Does Mr. Pilati know me, do you think? Suits have always suited the business woman in me. With all of this perfection and precision, it is hard to pick a favourite. Actually, it isn’t so much difficult as it is transitory; my favourite changes with every photo. Black. Silver. Capris. Cape. Drape. Crave. Mr. Yamamoto, Mr. Pilati, these are the reasons Y I love you. Images: YY via Elle.com; YSL via WWD.